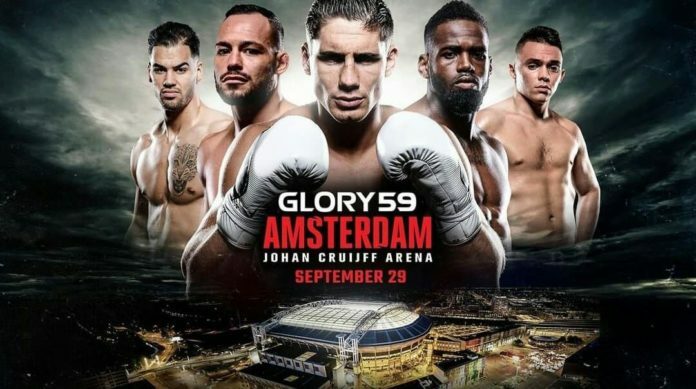 Kickboxing event GLORY 59 takes place at the Johan Cruijff Arena on Saturday September 29. The event is featured on the five-event schedule the promotion announced earlier this month. The reigning heavyweight champion Rico Verhoeven (54-10-0, 16 KO) headlines the show, going up against a yet to be named opponent. To date it is also unclear whether the “King of Kickboxing” puts his title on the line or not. Verhoeven is fresh off the win against Mladen Brestovac earned at GLORY 54. Coming out victorious by decision in Birmingham he made the seventh consecutive defense of his belt. The fight card at GLORY 59 also reportedly includes two welterweight featured fights. In one of the bouts ranked No.3 Murthel Groenhart (67-23-3, 38 KO) takes on a yet to be announced opponent. Another bout features ranked No.11 Mohammed Jaraya (64-6-0, 36 KO), who also faces a yet to be known competitor. In addition, according to the Dutch website Sportnieuws, middleweight Yousri Belgaroui and featherweight champion Robin van Roosmalen also battle out at GLORY 59. The match ups and more information is expected to be announced in the coming weeks. Up next is GLORY 55 New York taking place at Hulu Theater at Madison Square Garden on July 21 (July 20 in the US). The event features a series of international bouts with two titles contested on the top of the fight bill.